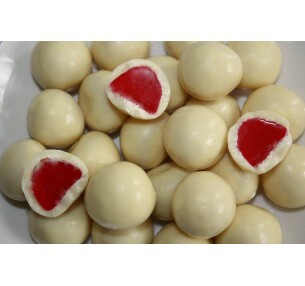 White Chocolate Raspberries have a chewy jelly centre coated in white chocolate. Buy by the kilo & save - great for your next party! INGREDIENTS: White Chocolate (65%) (Sugar, Milk Solids, Cocoa Butter, Emulsifiers (Soy Lecithin, 476), Flavour). Raspberry Flavoured Confection (34%)(Glucose Syrup (From Wheat), Sugar, Starch (Wheat), Water, Mineral Salt (331), Food Acid (330), Humectant (422, Flavours Colour (122), Glazing Agent (904), Mineral Salt (553), Modified Starch (1401). 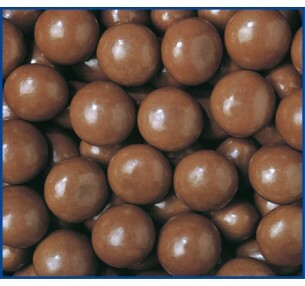 White Chocolate contains a minimum of 29% Cocoa Solids and a minimum of 20% Milk Solids. Chocolate Raspberries have a chewy jelly centre, coated in white chocolate. Share a pack with fam.. Milk Chocolate Raspberries have a chewy raspberry jelly centre, coated in milk chocolate. Buy by .. Dark Chocolate Raspberries have a chewy raspberry jelly centre, coated in rich dark chocolate. Bu..